Traveling through Transylvania, described as ‘the last truly medieval landscape in Europe,’ feels like one has gone back 100 years; there are mountain-side cabins in sight, horse-drawn carriages, shepherds with pitchforks and bales of hay. While it’s best known as the mysterious land of bloodthirsty vampires and howling wolves, you’ll see more of history, stunning geography and ski resorts. There’s a jewel in all of this and her name is Brasov. She’s surrounded by beautiful scenery, winding roads and the high Carpathian mountains. We stumble out of our bus and stagger towards the taxi park feeling quite whoozy. “English?” I ask the group of drivers expecting a hand shrug of so-so, or nothing at all. The cocky guy in the group answers, “No..we speak Chinese,” in clear English. I’m puzzled in confusion, and taken aback a little. We all burst out laughing. A face-palming moment indeed. We’re placed at the head of the taxi queue and end up with an overly chatty taxi driver who gives us the third-degree. He helps us with our luggage when we reach our accommodation, the Central House Hostel. It’s nestled within the busy Republicii street; and has a bubbly and welcoming staff who ensure the youthful energy spills all over the place. There are positive quotes scribbled everywhere in this hostel; up the stairs and even on the walls. We arrive early evening, at a time that both locals and tourists are abuzz with activity; walking, talking, having their dinners and clinking their drinks; while Mt Tampa quietly looks on in the background. 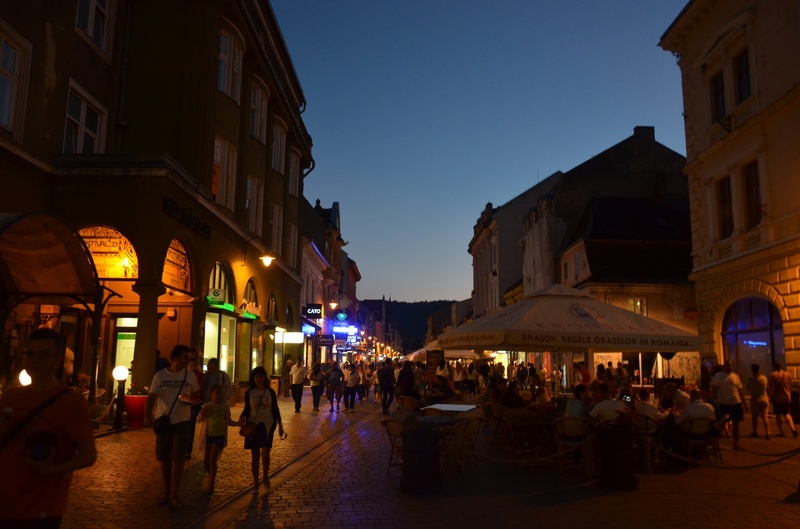 Summer is here, and Brasov is eyes wide shut. 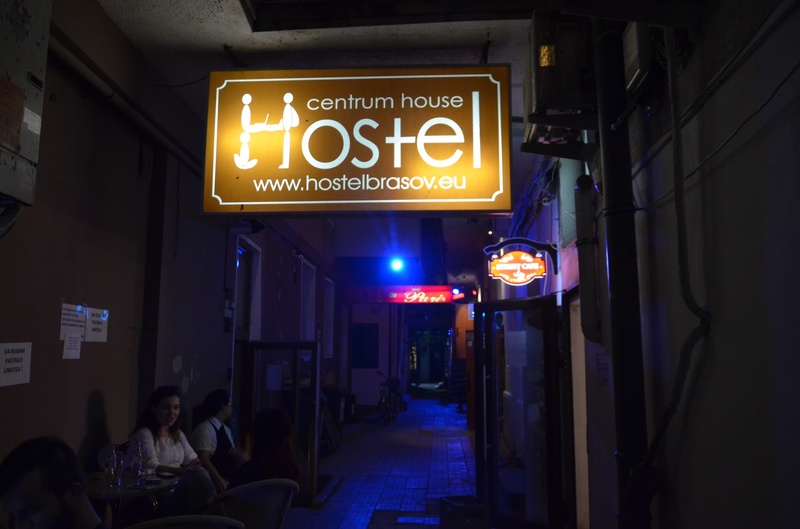 If Bucharest is the bomb, in Brasov you go through an awakening of sorts. Brasovians are cheerful, boisterous, and so friendly they pass off a vibe that urges every visitor to feel at home, humor being the watchword. Brasovians are all into your bizness..and not in a nosy irritating way but in a concerned, protective way. Brasov will have you feeling like a new chick that has hatched out of it’s shell and clambered into their world. Here, people don’t just stare..they holler and cheer on when my little one is taking a picture. 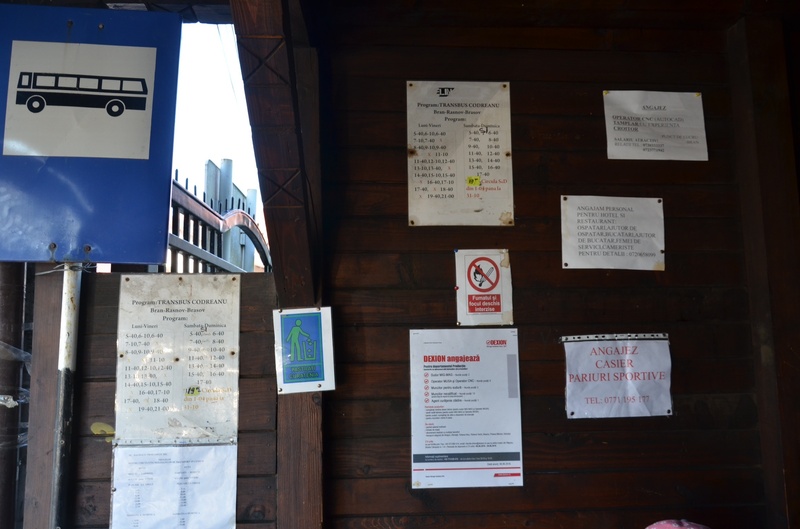 When at a bus stop wondering aloud which bus goes to Bran castle, Auntie Ada stops the whole bus load and inquires aloud, “If anyone understands Engleză..?” Shortly after, someone volunteers and directs us to our correct bus in English. While ambling through the city centre, Uncle Grigor startles us by hopping right beside me; beams his brightest, his hand around my back, and urges his wife to quickly take a picture. When at the bus stop asking my child to confirm whether we’d already purchased a ticket, cousin Cornel overhears and offers to walk us across the road to the ticket office, stands right there until we’ve gotten our tickets, reminds me to count and confirm I was given the right change, then walks us back to the bus stop. I can’t help feeling that all this good-naturedness has to do with oxygen..or the lack thereof.. Brasov is a whooping 2,133 ft above sea-level. Low oxygen choices and cool mountain air making everyone so content and happy. Brasov is like nothing I’ve experienced in my gambols..it’s a ‘make-you-feel-so-good-so-you-will-not-ever-forget-us’ kinda place. We take the mountain lift up Mt. Tampa at the cost of 25 lei for me and my child to and fro. The views from the top are breathtaking. 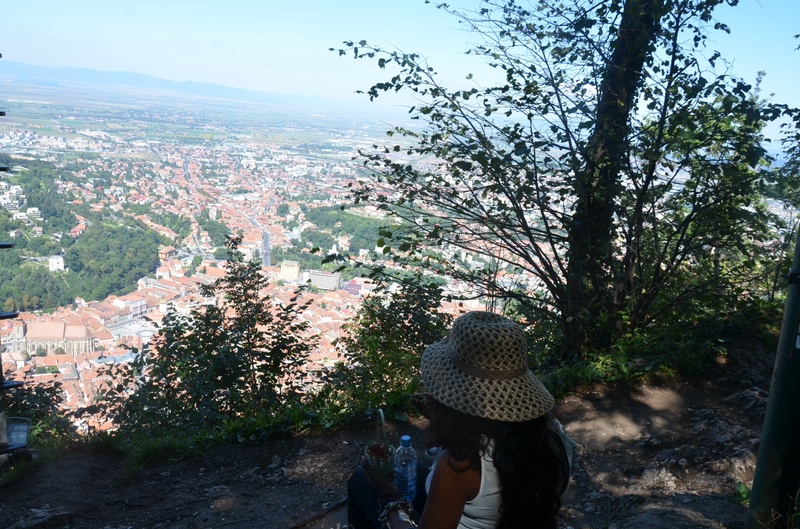 Munching on strawberries while overlooking Brasov from Mt Tampa. 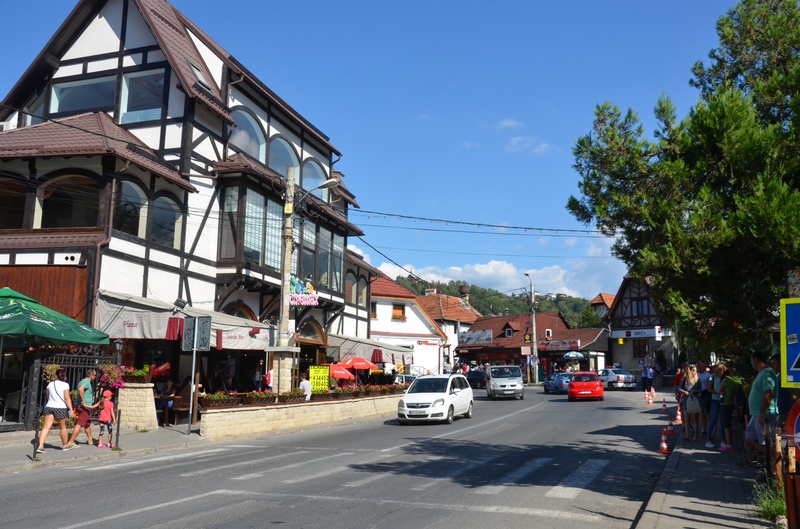 Being in Brasov is perfect for day trips to Bran (Dracula) castle and as well to Poiana Brasov that has the best of views and is ideally a hiking spot during the summer, and a ski resort in winter. For all the hype surrounding Bran castle, when you get there you realize that it has not so much to do with spotting Dracula, or bumping into vampires; rather there’s the history of a royal family that was resident in the castle in medieval times. In 1897, Bram Stoker penned a Gothic novel, Dracula. This story and subsequent movies found their way into the hearts of millions across the globe, and Romania took the story and run with it; after all, Vlad Tepes bore closest resemblance to the fictional Dracula by choosing to impale his enemies; a bloody and macabre punishment. The only connection Vlad had to Bran castle is that he was imprisoned there for sometime. Bram Stoker didn’t even see the castle, but many say that the description in the book matched the castle, so hordes of people are drawn to this place in search of a real life Dracula, only to sight-see the beautiful castle, and the furniture that the royals left behind when they stayed there. Vampire tourism is nevertheless quite big around Bran castle, catering to the needs of tourists who come a-visiting. There are shops, hotels and restaurants. There are artifacts, and souvenirs. You can purchase healthy snacks, fruit and berries in baskets from the hawkers walking about. 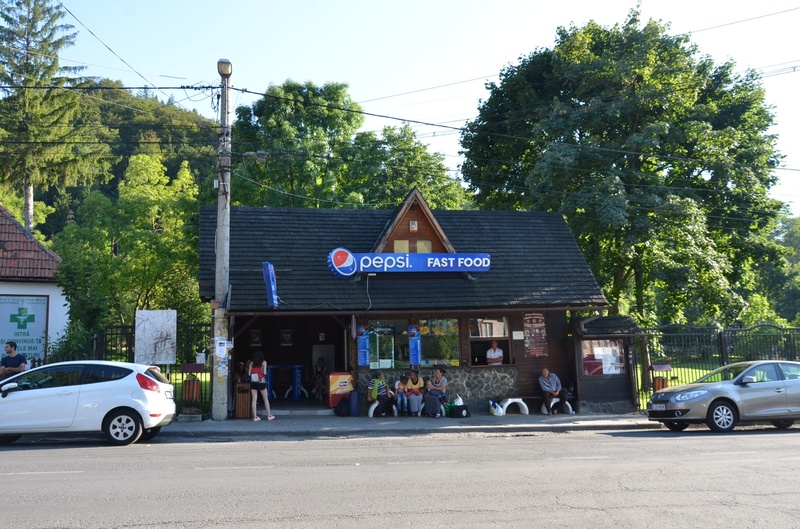 This restaurant outside Bran Castle doubles as a stop for the bus back to Brasov. 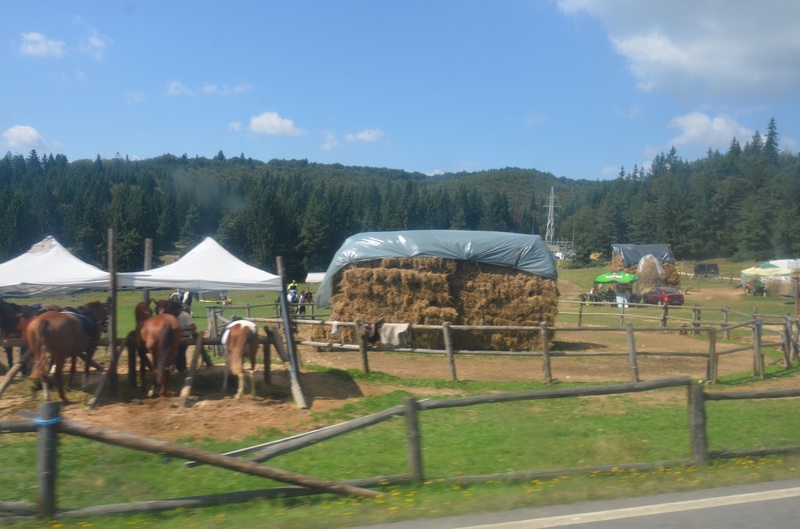 Poiana Brasov can be reached from Brasov by a thirty minute ride. It’s great for a little hike during the summer, and fun for kids. 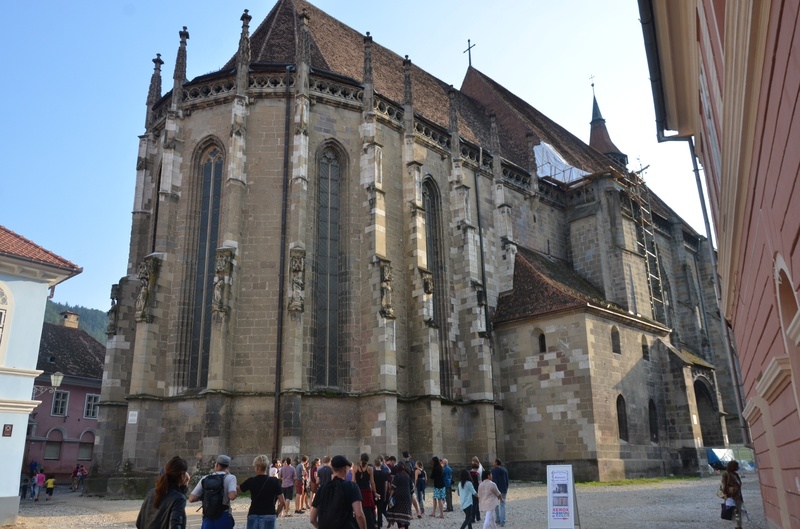 Our #BackpackingEasternEurope trip was quite an eye-opener, and though rigorous with all the overnight bus trips, we felt quite accomplished having spent our summer in this side of Europe. 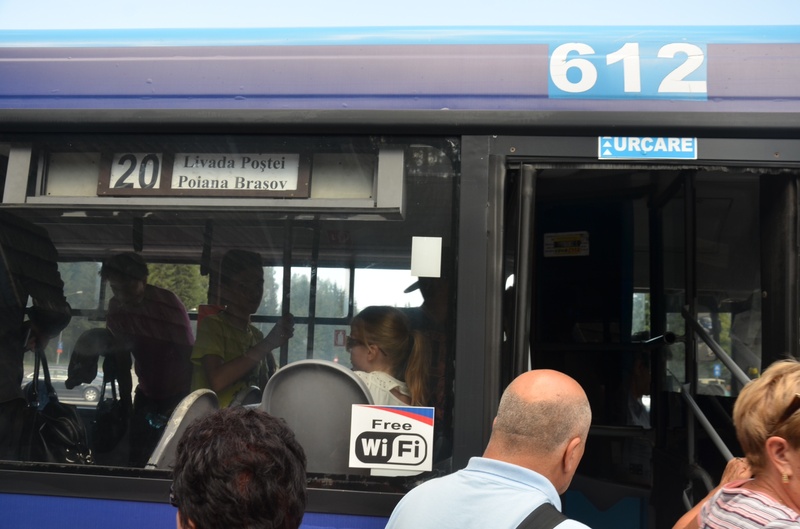 We had one last bus to Timisoara, from where we boarded the flight to Brussels Charleroi. it sounds like you had a good time, are you ever planning on going to south america? Yes, I did Selma! I hope to visit South America some day..I am not sure when.